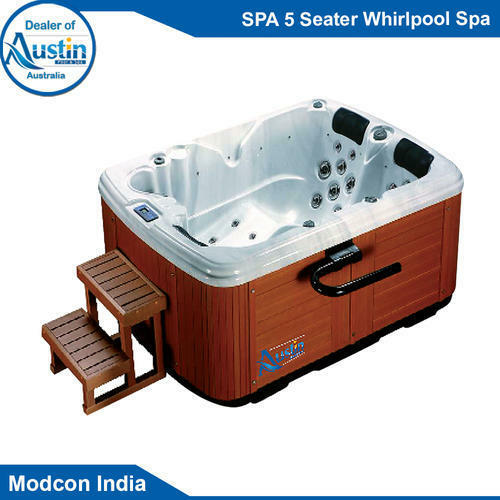 We are the leading supplier and distributor of SPA 5 Seater Whirlpool Spa in India. We obligated to meet the quality standards as per the industry norms. Being conceited by our in-depth industry expertise, we, "Pool Tycoon", established in 2002 are engaged in distributing a wide range of Swimming Pool Equipments, Water Treatment Chemical, Steam & Sauna, Pool Furniture, Swimming Pool Competition Equipments, Swimming Pool Snovalation and Pool Filtration Media. We are also having a well-equipped Manufacturing unit of "PW" Brand Swimming pool equipments in Delhi. Creating a niche in the market for its varied range of products, we have an expert team to cater to all types of problems related to swimming pools and ponds. Our products are engineered to highest quality, reliability and durability according to the market prices and standards.